How many miles of power lines are there in the United States? When a circuit is open, do electrons go backward, or do they just stop? How does a compact fluorescent light (CFL) work? How does a light-emitting diode (LED) work? There are more than 173,000 miles of high voltage transmission lines in the United States and more than 6 million miles of distribution lines carrying electricity to our homes. 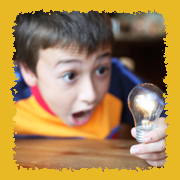 The shock you feel when you touch an object after walking on carpet is static electricity. When you drag your feet across carpet on a dry day, electrons from the carpet get transferred to your body. (Electrons are parts of the atoms that make up all matter.) If you then touch a piece of metal, such as a doorknob, the electrons jump to the metal and you'll feel a shock. 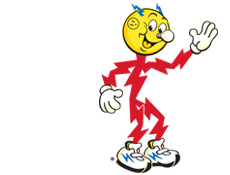 Lightning is a large discharge of static electricity. During a thunderstorm, clouds build up a charge when small bits of ice collide through a rising and sinking motion within the clouds themselves. The charges created by these collisions eventually fill up the whole cloud. When there is a big difference in charge between the cloud and its surroundings, the cloud discharges a lightning bolt. One lightning strike can carry up to 100 million electrical volts. That's as much electricity as about 8 million car batteries. According to Guinness World Records, Roy G. Sullivan, a former United States park ranger, was struck by lightning seven times over the course of his 35-year career. Lightning has burned off his eyebrows, seared his shoulder, set his hair on fire, injured his ankle, and burned his belly and chest. Ben Franklin probably did not do his famous kite experiment the way it is usually portrayed. (Franklin never wrote about it himself, and the only description we have of it was written by another scholar, Joseph Priestley, 15 years later.) Franklin believed lightning was a flow of electricity taking place in nature. He knew of electricity’s dangers, and would probably not have risked being struck by lightning by flying his kite during a storm. It is more likely that Franklin flew his kite before the storm occurred, and that his famous key gave off an electric spark by drawing small electrical charges from the air. There is not enough voltage in a regular household battery to cause a shock. However, car batteries are powerful enough to shock, so you should never tamper with them. In the early 1980s, there were about 18 deaths a year caused by hair dryers falling into bathtubs or sinks filled with water. Since 1991, hair dryer manufacturers have been required to include GFCIs (ground fault circuit interrupters) on dryer cords. GFCIs cut off electricity to prevent serious shock. Thanks to these devices, the number of hair dryer related deaths has dropped to an average of two per year. Compact fluorescent lights (CFLs) and other fluorescent light bulbs contain gases (argon and mercury vapor) that produce invisible ultraviolet (UV) light when stimulated by electricity. When the UV light hits the white phosphor coating inside the fluorescent bulb, the phosphor illuminates or “fluoresces,” changing the UV light into visible light. CFLs are very energy-efficient, using only about one-fifth the energy of a standard incandescent bulb. This is because all of the electricity they use goes toward creating light, whereas the energy used by standard incandescent bulbs creates heat as well as light. Like their energy-efficient cousins, CFLs, LEDs don’t waste energy on heat so they don’t get especially hot. But unlike CFLs, LEDs are illuminated solely by the movement of electrons in a semiconductor material. A semiconductor is a material with electrical conductivity (meaning the ability to transfer electrical energy) between that of a conductor and an insulator (hence the prefix “semi”). Inside an LED, when an electrical current passes through the semiconductor material, electrons move through the material and drop to other energy levels, and in the process they emit photons of light. LEDs are becoming an increasingly important and common light source because of their high degree of energy efficiency. We see them particularly in Christmas tree lights and the tubes that light up LED HDTVs.